Do you remember being a child and learning how the Earth spins like a top? A top has a visible shaft at its center. The widest part of the top is like the equator of the earth. When you look at a top, its shaft and circumference are tangible, visible. With the Earth, this is less true. Because we aren’t in a position to see the entire earth as one object (unless we are in space), we have to conceptualize the earth’s axis and equator. They don’t feel like solid things. Yet they are still real. When teaching yoga, I often refer to a student’s vertical axis. This is much the same as Earth’s axis. It’s very real but isn’t a tangible object. Rather, it’s a reference, and it gives us something around which to organize. So let me be more concrete. Your body’s vertical axis is basically a plumb line generated by a gravitational pull toward the ground you stand on. Around this plumb line, the weight of your body must distribute itself evenly. Otherwise, one of two things happens: 1) you fall over like a top that has stopped spinning, or 2) one side of the body needs to work hard to keep you from falling over. As time goes on, this second options gets tiring!. Stand in tadasana, (mountain pose). Don’t worry if you are a beginner and/or you don’t know how to do the pose “correctly.” Just stand vertically. That is tadasana. Bring your attention to your vertical axis, your plumb line. How do you know where it is? One way is to sway in the pose, such that you move around the axis. Play with swaying in tadasana, forward, back, and side to side. When you move around something enough, you start to get an idea of where it is. Your vertical axis is somewhere between front, back, and your two sides—that’s pretty obvious. But, you can get more specific by gradually making your swaying smaller. In other words, move in a smaller radius around your plumb line. Playing with smaller and smaller movements, you may hone in on where your axis is. Once you find this, you can stay in tadasana for a long time without any one part of you tiring. That’s because all your parts are organized around the plumb line, and your body’s weight is evenly distributed around it. Here’s a pattern I see in tadasana a lot: Hips and belly move forward of the vertical axis. Shoulders are nice and far back, perhaps over the heels, which might give the impression of having a plumb line. . . until you realize that the hips are off of this line—they are in front of it. The body is making something of a bow shape. Is this a problem? Well, it can put a lot of pressure on the low back. And if you do tadasana like this all the time, you may start to feel that that position is centered and plumb, when it isn’t. Stand in tadasana and push your hips forward. You can even exaggerate it (but stop if it makes your back hurt!) This is just to feel a particular pattern. Then, gather your hips back a bit so they are more over your heels. This is likely to tone your abdomen and gather your belly towards hour low back. It should feel nice on your low back, spreading and lengthening it. More generally, you may feel that you can grow upward all around your vertical axis. Your back lifts as much as your front lifts, so that your back doesn’t get compressed. This plumb line I’m talking about. . . where in relation to other body parts is it? It is an axis that runs just in front of your spine. Your spine can be a great reference, and we often hear about lengthening the spine in yoga. Nothing wrong with that! However, we can also get more precise and note that the the body’s true axis is in front of the spine, more on the inside. In tadasana what if you felt the length coming from a space just in front of the spine, a place that is more central? One thing this does is place the crown of the head in the vertical axis (not in front of it, as I so often see). So now we have crown, hips, and ankles all in one plumb line. This is a very strong tadasana! This vertical axis of the trunk, from hips to head, is essential for seated poses as well and especially twists. Twists need a clear axis to move around or else one side of the body becomes compressed or collapsed. You will get more benefit from twists if you find your vertical axis before moving into the rotation. Find a level, firm-seated chair with a back but no arm rests. Sit sideways in the chair such that the chair back is on the right side of your body. Before you twist, find your two feet flat on the floor and find your vertical axis. You can think of it like tadasana, except now you are “standing” on your two sitting bones instead of your two feet. From here, twist to your right and take your hands to each side of the chair back, so that your arms are somewhat engaged, helping you rotate. You can think of lengthening up through your axis the whole time, or it might work better for you to think of growing upward, then twisting, growing upward again, twisting a bit more, etc. The twist will involve the whole trunk, from head to seat. One note here: sometimes students aren’t sure whether they are supposed to keep their hips square while the trunk twists. My answer is that it is actually helpful for the pelvis to participate in the twist. It won’t turn a lot, but there will be a slight rotation of the hips around each other (and around the central axis). This will bring one sitting bone forward on the chair, and I encourage students to simply let that happen. The rewards you can gain from this awareness are about relating to the world that is around you. Being clear in your axis creates a stable vantage from which to better see outside of yourself. You can not only attend to what is in front of you but also to what is to the sides and all around. Then, pivoting in order to switch attention from one thing to another becomes more effortless and graceful. Also, it makes backing out of parking spaces a whole lot easier. Have fun playing with this! Namaste. Today we have an audio exploration that investigates movements of the shoulder blades. Awareness of the different ways the shoulders can move is essential to freedom and mobility in the upper body. It’s also vital vital for maintaining strength and stability. This inquiry brings particular attention to the relationship between shoulder movement and arm rotation, which is a necessary skill in asana practice (and handy for life in general). Just click on the image to listen. But when he gave up trying too hard, he was able to manage the difficulties much better. It was a difference between struggling to play well and just playing. This got him over the hurdle, and then he could approach it this way, on his own, every time he played it. Performing an activity, musical or not, can introduce difficulties. Today I’d like to outline a few simple steps used in the Alexander Technique to help help reduce mental and physical strain. These are things you can learn to do on your own. The first step we’ll look at is thinking of an activity that you find difficult. Does just thinking about it introduce any change in your tension, state of mind, or both? If there is a change, is that something you already knew, or is it a new discovery? Now actually do the difficult activity. Do you notice any of the same changes that happened when you first thought of the activity? Did you find it was hard to notice this in the middle of the doing? Let me add a more specific approach that I call “the easy drill” (borrowed from a teacher named David Gorman). The reason this works well is that people often respond to a difficult task with their whole being, adding tension of which they’re unaware. The “easy drill” invites a different response. You can look at this in activity, and it is fruitful to explore it in your yoga practice. You can also use it with more routine tasks such as such as cleaning or sitting for a period of time. The gist of this is, if you approach a task thinking, “this is going to be hard,” your system complies and makes it tough. So let’s work with a thing that’s hard to do. Take a small bit of it, and do it as easily as possible. But be willing to give up for now other things you want to happen. For a musician, for instance, you may want to have good tone, accurate pitch, correct rhythm, have the notes be clear…the list can be long! For someone doing yoga, it could be about remaining stable, increasing strength and flexibility, or looking good or “correct” in the pose. Now, use common sense and be safe (you don’t want to give up looking where you’re going if you’re driving), but be willing to give up anything you feel you “have to” do, even big obvious things, in order to practice easiness first, before the other aspects. After you do this, add in other aspects one at a time, without sacrificing the ease. Go back to just doing the activity easily if other aspects affect this. You may notice ways of thinking that influence your success. In the case of the clarinet player mentioned earlier, notice that trying could mean (or feel like): this thing I’m trying to do is hard, and will take much effort. Someone could get into a spiral of using more effort to perform an already effortful task, making it harder and harder. The Alexander Technique helps people gain awareness and free themselves from unneeded tension, which affects their ability to work and be at their best. This tension is usually part of a larger pattern of the whole self, a combination of thought, perception, physical sensation, emotion, and other aspects of one’s whole experience. Another way to address tension is to seek the guidance of a teacher who can help you notice if anything in your approach impairs your ability to perform a task well. Then the teacher can show you how to restore your natural ability to work with ease. 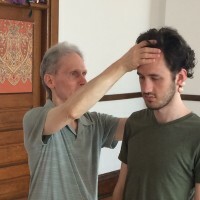 At Solaluna we are scheduling a series of Alexander Technique classes, beginning with a free class Monday September 15, from 7:00 to 8:15 PM. Four more classes will follow on September 22, 29, October 6, and 13. In the class we’ll look at features of general movement and invite you to bring any activity that you wish to explore. The space around us is a constant, a given. At the same time, an individual’s perception of space is highly variable. Spatial awareness affects how people see the world. One aspect of this is what scientists term proprioception, which is a fancy word that refers to a person’s awareness (conscious and unconscious) of space, position and movement. A healthy proprioceptive system allows clearer coordination, less pain, increased flexibility and ease in building strength. Disrupted proprioception interferes with these things. ​What’s more, spatial perception is also tied to one’s emotional state, ability to process information and adaptability in the face of challenges. These parts of a person are often seen as being something other than physical, yet the connection with spatial awareness shows that emotions and cognition have a physical basis. Just consider how you feel, both physically and emotionally when you have to sit in a cramped position for a long period of time. It can be informative to notice where attention goes in (or out of) the body. Often there is a narrowing of awareness to a painful area, or if a task must be completed, a tunnelling of attention in the direction of the work. These responses can have the effect of closing down access to a broader sense of space and volume. With this sort of experience, there is often a corresponding narrowing and intensification of particular emotions and patterns of thought. Therefore, practices that address spatial awareness can have effects on many aspects of a person’s being. Today’s audio offering is a spatial awareness meditation that uses contrast. In this case, the contrast explores awareness of space with eyes closed and eyes open. Our perceptual systems are geared to pick up contrast. Contrast is one of the most basic cues that a person’s system uses to process information. Using contrast in practice (whether meditation, asana or another activity) is a simple, powerful tool to hone and refine awareness and skill. Spring can be a crazy-busy time. This is especially true in the setting of a college town like Oberlin, with everyone scrambling to finish the semester. Plus outdoor chores and recreation beckon. We’ve learned that a slight drop-off in our attendance always happens this time of year, and because we’re facing many of the same demands on our time, we understand the reasons for it. As much as we encourage people to make yoga a regular activity (that’s what we’re in the business of doing after all), were also aware that there are times when life just intrudes. And we want you to know that if the pulls of life have carried you away for a time, the studio is here whenever you find the space to come back, and we’ll be happy to see you. If you don’t have time to get to Solaluna but are looking for a little guidance with a practice, here’s an audio recording of an asana sequence that strikes a balance between being accessible and challenging. This recording does require familiarity with bridge pose, seated poses, downward facing dog, squatting and lunges, so it’s not for raw beginners and should be modified as appropriate by anyone with injuries and/or movement restrictions. Want a visual reference for the practice? Stick-figure drawings of the whole sequence may be accessed here. Feel free to download and print. When viewed in your browser, the drawings may appear to be grainy, but they’ll print just fine. If you have any trouble, contact us. Yoga in America is a busy, buzzing thing. It’s astonishing how widespread the practice has become, and how many forms have proliferated over the past ten or twenty years. Particular kinds of yoga have become especially entwined in popular culture. One sign of this is the shorthand, the concise labeling used to describe different styles. These days, even when I talk with people who have never done yoga, they have absorbed concepts through the cultural ether and often have a vague sense about certain methods. So for instance, many people have an idea of what hot yoga is like, even if they have never done it. Other examples of this shorthand include “flow”, describing vinyasa forms that emphasize transitions between asanas, and “alignment-based”, defining an approach such as the Iyengar method which focuses on musculoskeletal precision. A label can be a beacon, guiding people to the practice that best suits them, but it can also lead to a superficial understanding of yoga. That said, this piece is not about convincing you that soundbite descriptions of a yoga style are a symptom of our superficial culture and complete ignorance of real yoga. Rather, these expressions can actually serve a useful purpose, but they have limitations. In general, a label describes a style’s most prominent characteristic. It communicates how the method engages the practice. It can be understood as the doorway to the yoga. It explains what the entryway is like: some entryways are straight and solid, some are curvy and flowing. The importance of an entryway cannot be overstated. It provides direction and focus, a place to go. An entryway is valuable for a novice student because it allows them to step into the practice and begin to comprehend it. 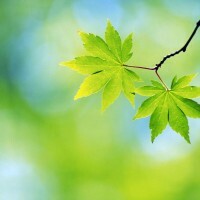 Beyond the beginning stages, it can continue to serve as a reference point. Especially during times when practice is shaky, a concise statement that encapsulates the method can be a support to fall back on, a return home. The shorthand label sometimes becomes something to rally around, a kind of tribal identification. When a person finds yoga that really works for them, it’s understandable that they would want to communicate those benefits, as well as seek out people who feel the same way. Here, it’s essential to recognize that the entryway is not the whole method. As much as a concise label is convenient and powerful, there are limits to how much it can convey. Sometimes people end up struggling with the yoga of their choice because they only hang out around the doorway and don’t proceed into the house. In other words, they over-identify with the label, which limits the practice and creates a narrowness in how the yoga is expressed. To extend the entryway analogy further, it’s likely that elements adorning one style’s door may also be found in a room inside another style’s house. 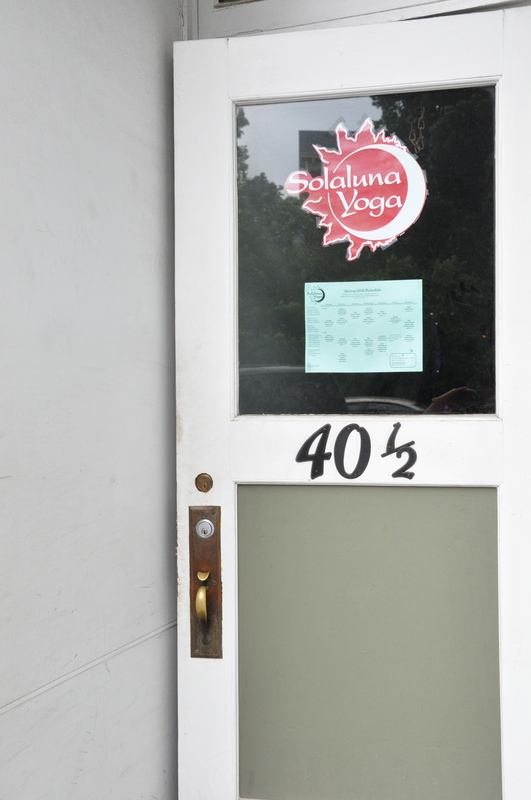 Only focusing on the elements in the doorway restricts access to this larger yoga. Ashtanga vinyasa is not just about flow. Iyengar yoga is not just about alignment. These are the entry points, but they are not the whole practice. One way to begin pointing out the relationship between the entryway of a yoga and its larger dwelling is to have a clear, slightly longer, but still-concise description that accompanies the label and fleshes it out. Because Simple Yoga is the method I teach, I’ve done this below. Simple Yoga: it’s about clear perception. Simple Yoga brings attention to basic states of physical experience, such as sensations of gravity, breathing and spatial awareness. Because these states are so fundamental to a person’s being, they provide a baseline that can be used to sharpen perception, to bring awareness into a more reliable experience of the present. In Simple Yoga, asana, breathing, sitting and related practices may be understood as providing a structure for exploring and honing perception. Developing accurate perception is a cornerstone of yoga in general, and its importance is reflected in the methodology of many different lineages and styles. It just happens that with Simple Yoga, this is the starting point, and with Simple Yoga, the means of establishing clear perception is through attention to simple things. As an example, a Simple Yoga teacher might guide students to become aware of how they perceive the spaces of the body using asana or sitting practice. A student might discover that they unconsciously put a lot of attention into the front body and the space ahead, and have little awareness of their back space. Becoming aware of the back space can lead to a more whole and present experience of physicality, and may allow more ease in movement and a feeling of greater support in the body. Paying attention to something as basic as this might initially seem rudimentary, but it can actually be quite challenging, and it allows a person to take on greater challenges. It is an effective way to develop a calm, steady mind, physical integration, and overall resilience. If you’ve never come to a Simple Yoga class and are curious, do stop by. If you’ve been practicing for awhile, deepening that practice and have an interest in teaching, look over the information about the teacher training, and if you have any questions, you can always contact us. Ever feel like there are some areas of your body that are impervious to lengthening or getting stronger? Maybe it’s your hamstrings, your shoulders or your back. Maybe it’s several of these. Perhaps you’ve been doing yoga for awhile, and the experience that you’ve accumulated only heightens your awareness that this or that body part seems unchangeable, simply tenacious in its resistance. It’s understandable that a person in this situation might increase their focus on the problematic area in an attempt to undo the restriction. Yet this can backfire. Sometimes the energy put into solving the riddle just increases the resistance. If you ever feel that you’ve gotten into a struggle with the resistant parts of yourself (and especially if you feel that you are losing that struggle), it can help to shift perspective. Take in more. Recognize that your entire body is participating in what you are doing. While you may feel specific tightness, pain or weakness in certain body parts, these sensations are communicating a message about your whole body and your whole self. The problem is not just where the resistance is felt. The problem is in larger patterns. This is especially relevant to asana practice. Asanas are whole-body patterns. Yet they are often understood in terms of their most easily identifiable actions, such as hamstring lengthening, hip opening or core strengthening. While this can be useful for classification, it can also lead to a partial comprehension of the entire pattern that a pose expresses. Practicing lots of forward bends is not necessarily harmful, but the approach one takes toward doing them matters. If the hamstrings are perceived to be tight, it’s tempting to narrow the focus and get pushy, wanting that opening to happen now. This sort of attitude generally causes the body to push back. If the practitioner persists, tendons will begin to strain and injury results, often (though not always) in the area that is seen as the problem. On the other hand, the response of the body can be utilized as a wake-up. Awareness of strain may be understood as a message to take in more, to broaden perception to the whole experience of the asana. If you’d like to investigate this, it can be helpful to start with a single asana. Any pose can work, but because I keep mentioning the hamstrings, I’m going to describe supta padangusthasana (reclining hand to big toe pose). Because supta padangusthasana involves a very direct elongation of the back of one leg, you can use it to notice if your attention gets sucked into the hamstring stretch to the exclusion of the rest of the experience. The other reason for choosing this asana is that resting supine on the floor provides ample support for the back, so it is quite safe. Just make sure to keep your awareness open to avoid overstretching the back of your leg. Begin resting on your back. Straighten your left leg along the floor. Then lengthen your right leg into the air. If you have moderate to substantial resistance in your hamstrings, you will need to loop a strap around your right foot to bridge the gap between your right hand and the foot. Even if you have the mobility to take your hand to your big toe, you will likely encounter some resistance in the back of your leg as you draw the foot in the direction of your right shoulder. Be attentive to this resistance and notice how it changes over time. Rather than feeling that you have to make your hamstrings lengthen, use awareness to notice when the back of your leg says yes to more space. At the same time, broaden your attention to include the feeling of your back body, the lengthening of the opposite leg along the floor, your breath, and any feelings of tension or ease in your shoulders, head and neck. Continue to take in the whole experience of the pose, letting the lengthening of your hamstrings be woven into that experience. If you are new to the pose, spend about 30-45 seconds initially. When you are done with the first side, proceed to the second and note any differences between the two. Over time and with practice, you can increase your duration up to 3 or more minutes per side. Notice if there are moments in practice where your perception narrows in a way that tightens and constricts the experience of what you are doing. Notice what happens when you can broaden your awareness, including your surroundings as well as your body. Consider how this might apply to other parts of life. Although a whole-body, whole asana experience takes some time to cultivate, it can offer a reliable way to open and enliven those parts that feel immovable and unchangeable. It doesn’t happen all at once, but it can happen, slow and steady. The students in the course I teach at Oberlin College have advanced to the point where we’ve begun learning half-moon pose (ardha chandrasana). 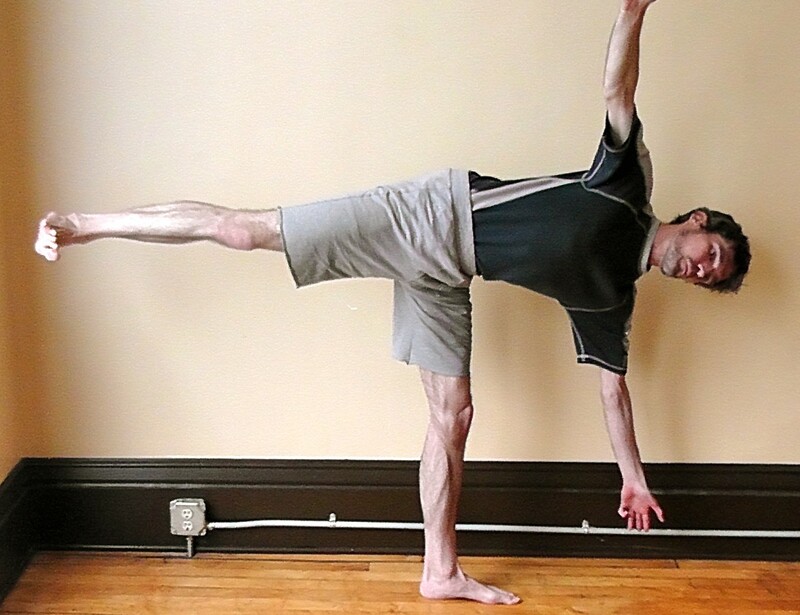 This is one of the most difficult standing poses, especially because it involves balance on one leg. I introduce half-moon using the support of blocks, sometimes a chair, and sometimes the wall. These supports make it easier to learn how to distribute weight and elongate limbs, so that balance over the standing leg becomes clearer. As I observed people tentatively begin to unfold into the asana, the usefulness of the support was apparent. I also noticed how some students tended to over-rely on the block or the wall, which caused them to remain in an unbalanced, restricted state. If the support was removed, these students would be unable to maintain the pose. They would fall out quicker than you could say yoga (or any other two syllable word). Support, in an asana and in life is a precious thing. Whether it is the support of the earth and the air we breathe, or the support of friends, family or coworkers, any action depends upon assistance that is beyond the capacity of a single person to provide for themselves. Yoga is a fantastic practice for learning this. Also precious is the ability to assess how support is utilized. While support is a necessity, its utilization can be more or less effective. Support used well translates into grace and ease. On the other hand, a person can relate to support in ways that actually hinder learning and development. Balance poses can serve as a great opportunity for people to explore both the necessity of support and also how to best use it. In the class, we moved away from the relative security of the wall and began practicing half-moon in the middle of the room. While sustained balance on one leg was more difficult here, the challenge offered students an opportunity to learn directly from the physical sensation of being in or out of equilibrium. When you fall out of a balance pose (or even when you start to feel unstable) it’s easy to feel that falling is what you are not supposed to do. When this happens, the tendency is to brace and tighten more, which often leads to further loss of balance. Instead, your greatest resource for finding balance is the internal sense you have of your body in space: the moment to moment sensations that alert you to your physical orientation. It can take some practice to learn to interpret this information with accuracy. Sometimes part of this learning process involves falling. As an advocate of the educational benefits of falling, I’ll clarify that it is important to be intelligent about the falling you do. For instance, it is foolish to attempt an asana that you are not ready to do, where the likelihood of falling and hurting yourself is great. On the other hand, it is intelligent to provide yourself with smaller challenges that build from your current ability and capacity, opening that capacity further. If the challenge you set for yourself involves balance on one leg, falling is a distinct possibility. Yet, rather being a disruption of the learning process, falling contains essential information for the development of greater capacity. This is where skillful use of support is so essential. For instance, if you attempt a balance pose over and over, and you keep falling out, it’s easy to become frustrated and stop doing the practice. Another way to look at the situation is that the act of falling provides information about support. Falling (in the role of the teacher) is saying, “Find a simpler way to do what you\’re attempting, and consider finding more support to help you.” That support might consist of a chair, a block or the advice of a teacher, depending on the circumstances. Being skillful also means avoiding over-reliance on otherwise helpful support. If a student uses props to eliminate the possibility of falling, they miss an essential vulnerability that opens to the experience of instability. Learning happens in that openness. What I related to my students is that a balance pose like half-moon keeps the practitioner honest. On two feet, an asana is easier to fudge without immediate consequences. On one foot, the teacher otherwise known as instability informs the practitioner whether their asana has integrity or not. I encourage you to pay attention to this wise instructor! Want to explore standing on one foot? There are lots of ways, ranging from simple and easy to intricate and challenging. If standing on one leg is difficult for you, have a wall nearby, but challenge yourself by contacting the wall less and less. Or keep the big toe-tip of the lifted leg touching the floor. You can lift the leg in front of you, swing it out to the side, or extend it behind you. In the standing leg, the activity of the toes (especially the big toe) is very important for effective balance. A useful practice to prepare for balance on one leg is to lift your heels off the floor and balance on the forefoot and toes. Then lower the heels and lift your toes off the floor. When you set the toes on the floor, lengthen them and then engage them with the floor. You can alternate between lifting heels/lifting toes/engaging toes for several cycles. As you become comfortable balancing on one leg, you can increase the challenge by closing your eyes. 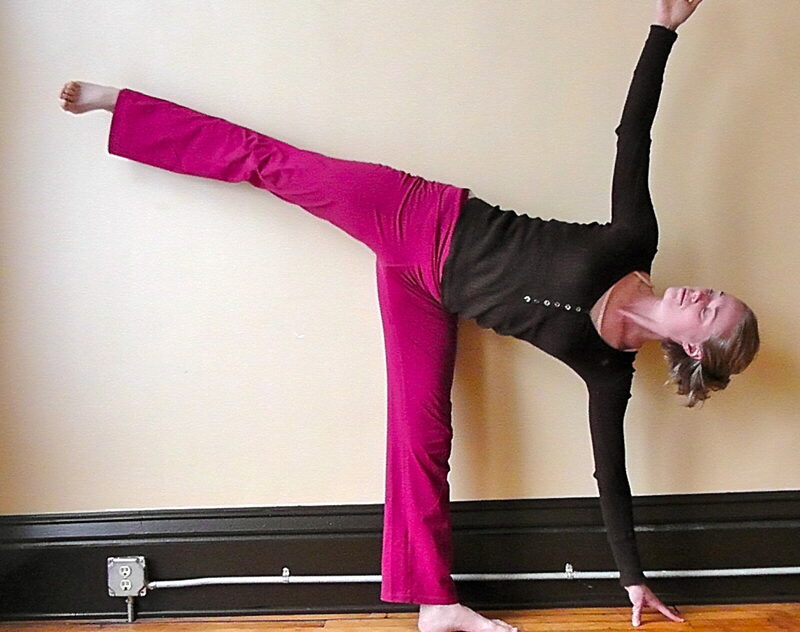 First do this with the support of a wall nearby, or with the big toe-tip of the lifted leg on the floor. Again, you can test your integrity by relying less and less on the support of the wall or the floor. These skills benefit from regular practice. If ardha chandrasana is a familiar pose for you, consider testing yourself by taking the lower hand/fingers away from the floor or the block. Can you maintain your balance? Or try lifting the heel of the standing leg off the floor. Have fun! Do less rather than more in the beginning. Do something that feels challenging and also something that feels easy and good. Let curiosity guide the practice rather than striving to accomplish something. This advice is meant to facilitate a positive experience during a student’s initial explorations. Doing less rather than more avoids the tendency to bite off too much and get discouraged. A balance of enjoyable and challenging elements helps the practice remain accessible and stimulating. Curiosity is especially important. It sustains liveliness and interest. Keeping curiosity front and center is a great way to maintain spontaneity, and to avoid a rigid, purely goal-driven attitude. Of course, having goals and objectives is important, but if a beginning student can stay centered in an attitude of curiosity, progress tends to happen faster, compared to an approach that involves striving to achieve the particular form of an asana. Also, as much as the emphasis on goals can provide structure and intention for the practice, a curiosity-based approach has much to provide in the way of framework. An attitude of inquiry allows a person to perceive contrasts, similarities and patterns. This sort of information is essential for developing structure within a practice. For example, curiosity allows a person to interpret sensation in their back and adjust the body in a way that leads to more space rather than compression and tightness. Curiosity encourages an experienced practitioner to maintain the attitude of a beginner. It’s easiest to see the specifics of this approach in an actual practice, so let’s look at a specific asana. Half-Dog (ardha adho mukha svanasana) is a pose that lends itself well to all three points of the advice I offer to beginners. Doing less rather than more: Half-dog is a great practice to do by itself, most any time of the day. It is especially wonderful as a counter to the effects of sitting or standing for long periods of time. Office chairs, countertops, and walls make great supports for the hands. Do something easy and something challenging: Normally what I mean by this advice is to do at least two different asanas or practices. In this case, easy and challenging elements are wonderfully contained in one pose. The elevation of the hands onto a wall or higher surface makes half-dog more accessible than full downward facing dog (and especially useful to those with wrist or shoulder problems). Yet at the same time, many students remark that there are ways in which half-dog can feel more difficult than its full-fledged sibling. The challenge in this case has a lot to do with clear transfer of force and elongation through the limbs and the trunk. Less flexible people tend to round the back in a convex shape (photo below left) while those with more mobility in the shoulders, back or legs tend to collapse in a concave direction (photo below right). If you\’re not sure what your tendency is, have a friend observe you in the pose. Integrity in the relationship between arms, trunk and legs is a matter of elongation supported by a balance of upward and downward forces. If you are tighter in your body, you may need to bring your ribs higher away from the ground to find that integrity. If you have more mobility, you may need to elevate at your shoulders or low back to avoid collapse and compression in these places. Let curiosity guide the practice: If you approach half-dog by trying to force it open, you won’t do it for long, and you won’t return to it. The pose opens through attentive listening. Whether you have a friend offering feedback about the form of your asana or you are exploring on your own, try different things. Notice the difference between doing the pose with the hands on a wall, at a right angle to the arms, and doing it with the hands flat on a counter or resting on the back of a chair. Experiment with wider or narrower stances in the hands and feet. Play with the effect of doing the pose multiple times with little breaks in between versus one longer, uninterrupted time in the pose. Listen to what your body says. If something is painful, see if you can adjust so that force is distributed more evenly. Do your best to figure it out on your own. If you can’t, get help from a teacher. Whether you have many years of practice behind you, or you are new to yoga, half dog is an excellent asana for finding and supporting one’s inner beginner. Happy practicing. Have fun! The other day, I was trying to get ready to teach class at 5:30 PM. I was struggling. It had been a full day, and I was dragging. I felt like I had no energy, and what’s worse, no inspiration or enthusiasm. You probably know how it feels not to have energy when you need to do something. It feels bad. What feels even worse is getting down on yourself for not having energy when you think you should. I was on my way into that particular downward spiral when a brief encounter with a friend saved me. . . .
She is right! Our species spent ages responding to important events like sunset and day length and adjusting energy output accordingly. It is a recent development that we began ignoring such things and organizing our lives around clocks and calendars (or phones and computers). Other animals don’t attempt to maintain the same schedules from one season to another, but we do. Last summer, when I started teaching this 5:30 class, it was not only broad daylight when we began, but also when we finished at 7 PM! That is a far cry from starting at 5:30 in winter, right around when the sun is setting. That would be equivalent to starting around 9 PM in the summer, which sounds like an unlikely time to start a yoga class. It’s all a matter of how you measure. If numerical time is the metric, 5:30 sounds perfectly reasonable. But measured by the sun, it’s a completely different story. Whether we like it or not, our bodies measure by the sun, so if we are going by something different, we’re bound to have body-mind trouble. My friend’s comment shifted my attention to the sun and to my body instead of an idea of numerical time, and that opened up a lot more space for me to feel what I was feeling. I realized that what I was feeling was okay. This is only one example of how different our daily lives can be when seasons change. Do you experience similar struggles when the sun goes down? Do you find yourself craving different foods? Do you feel that you get less done this time of year? Do you just plain old need more sleep? Most important, do you get down on yourself for any of these things? What I really wanted to write about in this newsletter was compassion for self. So here it is; this is where yoga comes in! This is the time to practice! Acknowledge when you are struggling. It’s the first step to having more kindness for one’s self. It isn’t always easy to say “I struggle with this,” but I recommend doing it as a practice of satya, or truthfulness. Just say what’s true and see what happens. Show up as you are. There are those times when you are tired and don’t feel ready to do what needs done, but you still have to do it. Striving for energy that’s not there only feeds the depletion. On the other hand, there is a truthful quality to acting with respect for one’s current capacity. How would it feel to go ahead with what you need to do, but not to reach for more energy than you actually have, just show up with what you’ve got? Remember that it’s not forever.​ The cyclical nature of sun and seasons means that nothing stays the same for long. In the darkest days, we are already well on our way towards more light and longer days. That’s where we are now, at the beginning of February. Spring is coming. I’m leaving the 5:30 class at that time because I know that it’s not forever, and I can do it for these weeks until it gets easier again. Also because it would be a big pain in the neck to change it and then change it again and again for every season. It’s not ideal, but it’s a descent compromise. And when it really comes down to it, self compassion is the thing that’s really going to get me through.